What is this 1485 Wine Club? The 1485 Wine Club is a club which you join to ensure continuity of supply – wine supply! Why the 1485 club? 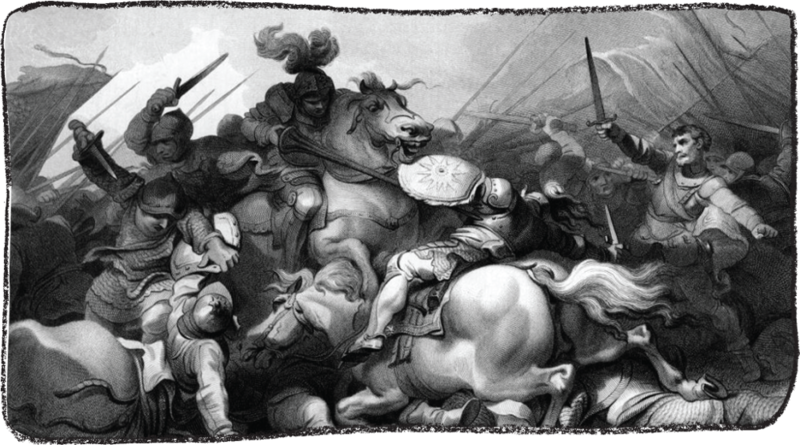 1485 was the year in which the Battle of Bosworth was fought on Bosworth Field in Leicestershire, England. The battle was the final clash in the English struggle for power , the War of the Roses. Richard III was killed on Bosworth Field, the last English king to die in battle, and this marked the start of the Tudor dynasty under Henry VII. Join the 1485 club and you will receive a case of wine from Battle of Bosworth and Spring Seed Wines twice a year. Your chosen dozen will arrive at your door in April/ May and September/ October to the address that you have nominated. Choose from a red, white or mixed dozen, depending on your preferences. The dozens will include wines from the Battle of Bosworth and Spring Seed wines – both are made by Joch, and everything is organically grown and certified. Joch will handle the wine selection for your wine pack. Relax, someone else is ordering…. As members you will get special treatment and some TLC. See the benefits, below. Sign up and join the club! No joining fee or ongoing fees, hurrah! You will receive 15% off cellar door purchases outside of your designated wine club packs, either from cellar door or online (using the wine club coupon code you will receive with your membership card). There will be newsletter in every pack containing vineyard and winery news, maybe a recipe or two as well as other bits and pieces. You will have first bite of the cherry on any special offers, wine one-offs, labelling disasters, failed export orders, termite affected wines (true story). You will be given the heads up before anyone else on special events either in the vineyard or interstate. Thank you so much for deciding to join our cellar club, the 1485 Wine Club. Congratulations! Please select the cellar club pack you would like to receive. NB: closing date is 28th Feb 2018 for the March 2018. Click above to select the 1485 Wine Club red wine dozen. Click above to select the 1485 Wine Club white wine dozen. Click above to select the 1485 Wine Club mixed wine dozen. Now, down to the nitty gritty. We need your delivery details, phone numbers, email addresses and of course credit card details. Already a customer? Log in to continue. I subscribe to join the BoB cellar club. I understand the obligations of the BoB membership and request that a dozen wines of Joch’s choosing be sent to an address nominated by myself bi-annually or until I cancel my membership by email or in writing. These orders are not to be purchased for resale by a liquor licensed person or their representative. Liquor Act 2007 - It is an offence to sell or supply to or obtain liquor on behalf of a person under the age of 18 years. Congratulations on deciding to join the 1485 wine club. Click on the pack type you wish to receive twice a year. Fill out all of the details (address and payment details) and your membership will commence. We will send you your cellar club card with your name and number and an introductory letter. Your ongoing commitment to maintain member benefits will be to receive your nominated pack twice a year in March/ April and September/ October. We will send your nominated pack twice a year to the shipping address on record, and your credit card will be debited to the correct value, based on which wine pack you selected initially (white, red or mixed, dozen or six pack). By signing up for membership, you acknowledge that you will automatically receive and be charged for you subscription cases on an ongoing basis, unless you have suspended your regular shipments or cancelled your membership. You can cancel your membership at any time, just drop us a letter or email, or ring us. If you wish to skip a shipment, or cancel your subscription, you must do so within 2 weeks of the next shipment date, otherwise your credit card will be charged, and the case dispatched. Please let us know of any changes to your shipping address, email address, and/or credit card details. Credit card and other personal details are held under strict confidentiality, and used solely for the purpose of processing wine club shipments. We do not store credit card details, they are held by our secure third-party payment gateway, eWay. You have to be 18 years minimum to be a member of the 1485 wine club. If for some reason you are not satisfied with the wines that have been delivered, or if they have been damaged, please send the wines back to us so we can issue a refund. That’s all the fine print for now, simply relax and wait for the wine to come your way.